Royal jelly is one of the richest substances found in Nature. As the seasons change, its exceptional content in rare nutrients makes it invaluable for effortlessly overcoming bouts of fatigue and finding new energy. It is produced from a very sweet, whitish substance secreted by worker bees between their fourth and fifteenth day of life. It is the sole source of nutrition for larvae destined to become queen bees, and for adult queens once they leave the colony. Royal jelly is considered an exceptional substance because of its rich content in essential nutrients. The jelly is a kind of thick, whitish paste with a faint smell but a hot, acidic taste which makes it particularly difficult to swallow in its fresh, non-lyophilised (non-freeze-dried) form (1). Boost weak immune systems, especially during changes in season. Restore energy, drive and vitality in periods of fatigue and exhaustion, due to its comprehensive and complex composition. Restore youthfulness to the skin and nails (hence its widespread use in many specialist cosmetics). What are the exceptional components found in royal jelly? The chemical compounds found in royal jelly are quite extraordinary, comprising a wide variety of carbohydrates, lipids and proteins. According to the scientific literature, however, it is the fatty acid 10HDA – the content of which varies between 3% and 5% - which is the most active compound. 10%-20% of royal jelly is made up of carbohydrates, the main ones being fructose and glucose, which account for around 90% of total carbohydrates. It is not uncommon to also find galactose, maltose, trehalose, turanose and palatinose (2). Proteins are a major constituent of royal jelly. Free amino acids (especially proline, lysine, glutamine and glutamic acid) are present in significant quantities (3-4), as are remarkable proteins called Major Royal Jelly Proteins (MRJP). Produced by the bees’ glands, these rare proteins belong to the family of apalbumins (5) and play a role in the function of the bees’ cognitive system. Royal jelly is also the only known source of an anti-microbial protein called royalisin (6). Last but not least are the jelleins which are composed of 8-9 amino acids. Royal jelly does not contain large quantities of lipids but those it does contain are of exceptional quality. The most prominent fatty acid is 10-hydroxy-2-decenoic acid (10H2DA), a quite remarkable compound. There is also gluconic acid (24 %), 10HDA (22 %) and various dicarboxylic acids (5 %) (7). Unlike the majority of animal and plant-source fatty acids, those in royal jelly are short-chain (8-10 carbon atoms), recognised for their beneficial effects on the gut mucosa. Royal jelly contains a number of vitamins, particularly all the B group vitamins. It also contains several minerals including potassium, calcium, magnesium, zinc, iron and copper. Where does royal jelly come from? How is it produced? Royal jelly is the sole source of nutrition for queen bees and larvae in the first days of life, and is thus particularly rare. Fortunately, a technique has been developed in recent years to make it more accessible. Having a healthy, high density colony, as a weak hive produces very little royal jelly. Ensuring the hive has sufficient food in the form of honey or concentrated syrup. Isolating the queen in order to ‘orphanise’ the colony and thus stimulate production of royal jelly for rearing a new queen. Grafting larvae into queen cells using appropriate tools and specific beekeeping skills. Collecting the royal jelly after three days by scratching the wax deposited by the bees from the queen cells. The royal jelly offered by SuperSmart is freeze-dried and encapsulated using a modern technique which leaves its precious components unchanged. This process results in it losing almost two-thirds of its weight in water: 100mg of freeze-dried jelly is equivalent to around 300mg of fresh jelly. What are royal jelly’s mechanisms of action? Royal jelly’s mechanisms of action come from its composition and exceptional diversity. More powerful than honey (8), its antioxidant effects are believed to be comparable to those of vitamins C and E, as a result of its high peptide and free amino acid content (9). Royal jelly is considered a tonic in traditional Chinese medicine, while in Eastern Europe, it is regarded as an excellent adaptogen (a substance which increases the body’s resistance to stress). Like honey and propolis, it has been used by humans since antiquity. Multiple traces have been found of associations between humans of the Neolithic age and wild bees (10), long before apiculture was created concurrently by various civilisations, such as the Maya or ancient Rome, around 2400 BC. Some believe its potential benefits for human health are based on the effects it induces in larvae: it is royal jelly which is responsible for the development of the queen’s reproductive organs and which accelerates her emergence from her cell (15 days for the queen compared with 21 for a worker bee). The exceptional fertility and lifespan enjoyed by the queen bee is thus due to royal jelly. Can royal jelly be combined with other substances? Royal jelly combines well with ginseng, green propolis, Robuvit®, a French oak extract used for reducing fatigue, and Asc2P 250 mg, a potent and stable form of vitamin C.
Should it be kept in the ‘fridge? There is no need to refrigerate freeze-dried royal jelly. Who is likely to benefit from royal jelly? Everyone can benefit from royal jelly, but it may be particularly useful for sportspeople, pregnant women, the over-40s, delicate individuals and those suffering from fatigue or recurrent illness. What advantages are offered by this particular supplement? Its convenient format: royal jelly has a particularly unpleasant taste making it impossible for children to swallow … SuperSmart’s product comes in no-fuss, easy-to-take capsules. Its 100% organic source. Apiculture has become more difficult nowadays due to the fragility of bee colonies and the use of phytosanitary products in the environment. That’s why this supplement is produced without the use of any organophosphates, chemical repellents, paradichlorobenzene or antibiotics near the hives, something which cannot be said of many cheaper royal jelly supplements. Its precise content in 10HDA. 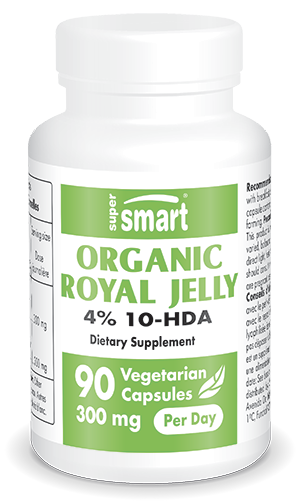 This supplement’s content in 10HDA, the most beneficial fatty acid in royal jelly, is guaranteed at 4%. Scientists have shown that the percentage of 10HDA is related to the source of the royal jelly: good quality jelly has a higher level of this fatty acid. Most royal jellies tested contained a maximum of just 2-3.4 % 10HDA. A dose of 2-3 capsules a day is recommended as a course of treatment that can be repeated several times a year if required. It is usually taken before breakfast, for between four and six weeks.